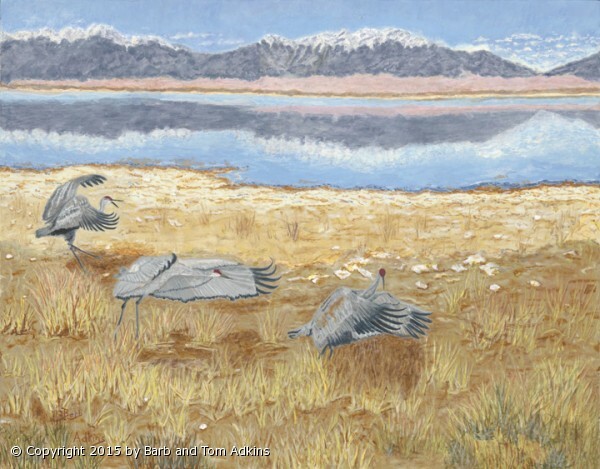 Sandhill Cranes landing at the lake north of Monte Vista, CO. The birds have such large gorgeous wings that seem to flow effortlessly in flight. Once I reviewed my lakeside photo with mountain reflections, I immediately knew it would be perfect for the Sandhills coming in to land. We had stopped at a park after driving for several hours down HWY 285 from Evergreen. What a nice surprise it was to discover this lake with the water so quiet and still & the mountains to the East were reflected in the water. The peacefulness of the setting and the colors told a wonderful story. Of course my camera was at hand. The resulting photo begged to be painted. Later we arrived at Monte Vista National Wildlife refuge to see, literally thousands of Sandhill Cranes, flying overhead, coming in for landings, jumping, dancing with their spring mating partners, & then taking off again. All of this was mixed with Canada Geese and a few ducks. And, yes, the squawking of the birds. This is the Spring Mating and Migration Ritual at Colorado Monte Vista National Wildlife Reserve. 10s of thousands of Sandhill Cranes on their way North. The 7/8" edge of this painting is painted as a Gallery Edge, painted to match and compliment the picture. It is framed in a Silhouette Frame that will show off the Gallery Painted Edge. When you are coming into a room or down a hall the effect is to give a color visual of something to see that is different or unexpected, rather than the regular edge of wood frame. Giclees' are available on high end Torchon Archival paper or on Canvas. Please call for sizes and pricing.The Painted Gallery Edge on Silhouette Framing gives the painting a Third Dimension and brings one into the picture as you approach it from any direction. Gallery Edge on Custom Walnut Silhouette Frame.